First things first: it bugs me, too. Violating a court order, Mary Ann Grady Flores continued to protest drone warfare at an Air Force Base in upstate New York. She was arrested and jailed, sentenced (over the objections of the prosecutor) to a year in prison, but as far as I can tell from a cursory Google search, is still out on bond while her case is being appealed. While most peaceful protesters are tolerated by authorities, it is not uncommon for them to spend time in jail. Jail time is, in fact, a key part of civil disobedience strategy, as it highlights the irony of a government that has to protect its enormous firepower from sign-waving grandmothers. And yes, there's no denying that the gun-loving, government-hating right wingers occupying the Malheur Wildlife Refuge post a far greater threat to government officials, ordinary citizens, and themselves than do any pacifists who have ever tried to stand in the way of a tank, missile, or front entrance to a military base. Nor is it right that so many persons of color are almost routinely shot by trigger-happy police. But getting upset about the injustice of either of these comparisons is wrong. It's the game of false equivalency, of faulting an apple for not being more like an orange, a rom-com for not being as exciting as an action movie: the Malheur occupation is just not the same thing. First, consider the difference between occupying a remote wildlife refuge that isn't being staffed during the winter and blocking an entrance to an air force base through which official vehicles have to pass all day long. And yes, I mean blocking: as peaceful and nonviolent as they may be, these activists are very likely standing in the way of large trucks. Remember this image? 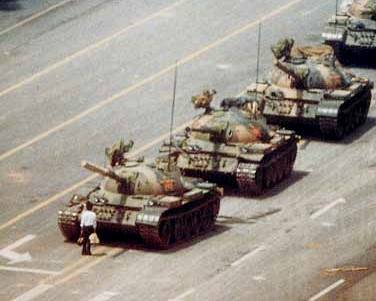 The location of this shot is Tiananmen Square in Beijing, but it perfectly encapsulates the primary strategy of the nonviolent activist: get in the way of the war machine, putting your life on the line, and dare it to keep going. It doesn't always end well: protesters sometimes give their lives to make a point. Much more often, though, protesters are simply dragged away by security forces, locked up for a few days, then released. In the meantime, whatever agency is being protested is inconvenienced, obstructed, delayed from implementing a policy; and sometimes, enough time is purchased by the protest to bring about a change in policy. Now let's look at the Malheur occupiers: they have done some minor property damage, taking down fences, covering up signs, but for the most part, they're just squatting at an otherwise dormant federal facility. At some point, they'll be in the way of American citizens--mostly birdwatchers--exercising their right to visit a public facility. These are just not the same situations. Whether or not you're in favor of what's going on behind the walls of the Air Force Base, it's clear they need their vehicles to have access to the facility. Meanwhile, the rangers in charge of the refuge weren't even there when the occupiers moved in; and since their role is essentially staying out of the way of the wildlife they oversee, it's just not that urgent that they get back in there, especially in the middle of winter. Here's the second, much more significant difference: the Malheur occupiers have guns. I'm aware that the police and the FBI also have guns, and other, more powerful weapons. I'm aware they could descend on the refuge with a massive show of force, hunting down every occupier, probably killing quite a few of them, and taking back the refuge. And if this was 25 years ago, that's what they would've done. But here's where we've made some progress: slaughtering protesters is not how our police forces do business anymore. And in an armed standoff, there's no way to guarantee that there won't be blood spilled. So the authorities are biding their time. It's not a "no problem" response: it's a careful response, that seeks a peaceful solution to a situation that is far from critical. The longer the police practice restraint, the less attractive it is to the protesters to camp out in frigid conditions, and the harder it is for them to insist that the US government is a tyrannical police state enforcing its policies at the point of a bayonet. Meanwhile, peaceful protesters, by definition, don't carry guns. That makes it a lot easier to arrest them without anyone getting shot. One final point: just because the Malheur occupiers haven't been arrested yet doesn't mean they won't be. They've committed some significant crimes, and once they're in custody, they'll do some hard time. One thing they have in common with the pacifist grandmothers: their protest is extremely unlikely to result in any change in federal policy. Marches, sit-ins, hunger strikes, occupations--at best, these protests foster awareness. Sometimes, that can lead legislators to alter policies. Mostly, it's a frustration to the citizens who find their commutes disrupted and their birdwatching expeditions delayed. It would be different if the feds moved in with guns blazing. Then we'd definitely see some change: the militia movement would be energized, enraged, inspired to engage in further occupations, possibly acts of terrorism (remember Oklahoma City?). So I'm fine with the occupiers getting different treatment from the pacifist grandmas. The occupiers won't get what they want, they'll still go to jail, and nobody dies. That's a win-win-win in my book.